Undaunted by having lost this post to an electrical failure earlier, the Phactor will endeavor to X-plain another confusing botanical subject - the lotus. Lotus, as a flower of myth and legend, is tied to so many stories in so many traditions, naturally things are going to get mixed up a bit. Leaving the automobile out of it, what plants are actually called lotus? 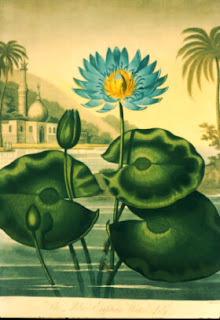 The Blue Nile lotus is actually a waterlily (Nymphaea) as illustrated in the wonderful old botanical painting. And when Homer wrote of "land of the lotus eaters" this was the plant he was most likely to have been thinking of. The sacred lotus of India and SE Asia is Nelumbo nucifera, which is not a waterlily at all, however its similarity to waterlilies caused it to be misidentified as one for a long time. And both can be easily mistaken for one another in artistic and figurative representations. These medallions are ceiling paintings from a temple in southern India. The one on the left could be the golden lotus (below) and the one on the right either a waterlily or a sacred lotus. As if that wasn't enough, the golden lotus, a much revered plant itself, is actually a many bracted, many flowered infloresence in the banana family (Musella lasiocarpa). And this sort explains these cases of mistaken identity. The flowers of waterlily and the sacred lotus are both pretty large and have lots of overlapping petals. And in first appearances, the golden lotus looks likewise, although it isn't just one flower at all. And to further add to the confusion the genus Lotus (called bird's foot lotus) belongs in the bean family, and why this bean came to share this name is unknown to me. There is also the Zizyphus lotus, a tree of the Rhamnaceae with edible fruit, esteemed for its medicinal uses like its congeneric the jujube. Even in just Eastern Andalusia there were huge variations in the edibility of the fruit. Some were, presumably, the more domesticated kinds, plump, sweet, juicy and very flavoursome. Some were just dry, but they were in near-desert conditions. I think it is also found in North Africa so has also been promoted as the lotos of the lotus-eaters of Homer's Odyssey. Not a "flowery food" though. The Lotophagi were obviously addicts of something. The Nymphaea waterlily is a candidate, as it has been shown to have highly sedative and euphoric effects, especially when mixed with alcohol. I have seen it stated that the sacred Indian (etc.) Lotus Nelumbo was found in the Nile but it went extinct before modern times. This is so powerful that the Vietnamese lady who sold me the Nelumbo seed plumules warned me very solemnly never to use more than a half-teaspoonful once before bedtime. She also told me it was good for people who were crazy with stress. All parts are eaten of both Nymphea and Nelumbo, the safer, less bitter parts in great quantities. Euryale ferox (foxnuts) is another sedative waterlily used in China. The seeds of an eastern Zizyphus are used in "Traditional Chinese Medicine" for the high content of sedative alkaloids that are said to "calm the spirits". As far as I know the Diospyros lotus, a type of Persimmon, has no narcotic effects. There is another candidate in the region: Cannabis. In North Africa it grows wild in many areas. The flowers are eaten for their effects, everyone knows they cause the famous "amotivational syndrome" and amnesia. They also produce the highly nutritious seeds still used throughout the mediterranean region roasted or candied. Full of protein and high-quality oils they might be able to survive on them as long as they ate plenty of vitamin C-rich fruit. Luckily they would be suffering the "munchies", because they probably couldn't get it together to cultivate any crops, just wait for the pomegranates and dates falling out of the trees. There is a plant called Gelotophyllos in Ancient Greek - Laughter Leaf. Pat, thank you for the very informative comment. Most authorities think the "lotus-eaters" were eating the Nile waterlily. Waterlily rhizome and flower buds are eaten, and their sedative quality is noted from many sources. It is very doubtful that Nelumbo was ever found in the Nile, and its sedative properties are suspect as well. The immature seeds are regularly eaten in SE Asia as a snack, but none of my resourses indicate any medicinal properties at all. This is the trouble with folk medicine; lots of false positives. And you placebos always work better when you've been warned about how strong they are. I completely agree about the Lotus and legumes. You are right about it being an ancient Greek name, but why call them that? Does the world need another plastic tomato?